I’m A Shopping Wild Woman! If you’ve been following my blog you might remember that I don’t really enjoy shopping. In fact I hate it and I usually put it off as long as I possibly can. I’m actually fascinated by the women on TV who go shopping every day. They go to the malls and department stores where they seem to spend hours trying on clothes, shoes and makeup. They buy new appliances, sheets and bedding and new towels for the bathrooms. I hate to admit we’ve still got a few of the same towels we received as marriage gifts 27 years ago. Some of these women even trade cars faster than I swap out socks! Amazing. My idea of a wild shopping spree is picking up two new pairs of Wranglers and a pair of Ariat boots at the feed store when I go to buy a load of feed or vet supplies. I don’t even take the time to try on the pants anymore. Yep, I’m not what you would call a shopaholic. I don’t really have a specific reason why I don’t like to shop but I do have a theory – perhaps shopping is more fun if you actually have money to spend. Since this is rarely the case around here I’ve decided shopping is basically a waste of time. I went shopping at a small ranch south of Hot Springs. As with most of my shopping sprees, this trip involved a trailer to haul home my purchase. This time I took this one. 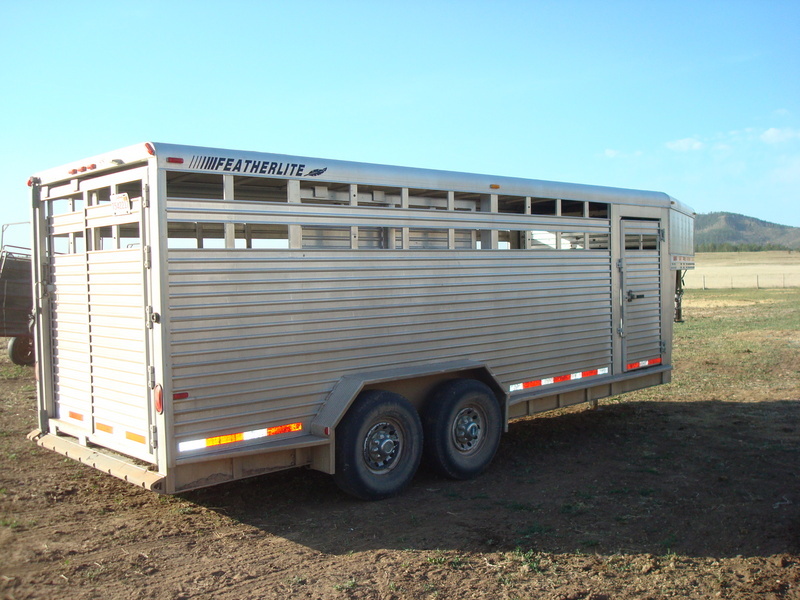 I bet you’re trying to figure out just how many pairs of Wrangler jeans and Ariat boots it takes to fill this trailer – aren’t you? The world may never know because this time I didn’t buy clothes or boots or even new appliances. This time the ‘Pistol’ is a horse. 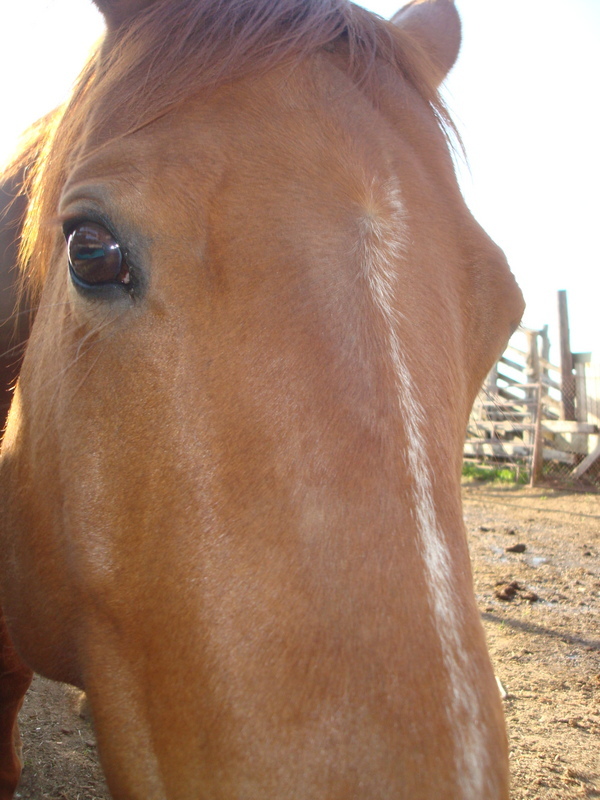 In fact she is an 8-year-old registered quarter horse mare who stands about 14 hands tall. She is sorrel colored with only a narrow strip and snip on her nose and I love her already. Her full name is Leo Sans Pistol and she is quick. She has some cutting experience and loves working cattle so I’m betting that this combination will probably add up to me ending up in a pile on the ground a couple of times before we get used to each other. But that’s OK – I still bounce pretty good for an old lady. She’s a sweetie and very curious with a great disposition and a lot more git-up-and-go than I’m used to so she can definitely kick it into warp drive when needed. And you know what? I think I could get used to this whole shopping thing. I am pretty sure this post will show up as having been posted a day late but actually it is still Mother’s Day where I am so HAPPY MOTHER’S DAY!!! I didn’t get to see any of my kids today but they did call and wish me a happy day anyway so life is good. I have been running so fast and furious for so long that I don’t even know where to start so let’s see what’s on the camera. We are still buying yearlings so we have a new batch to brand at least once a week. 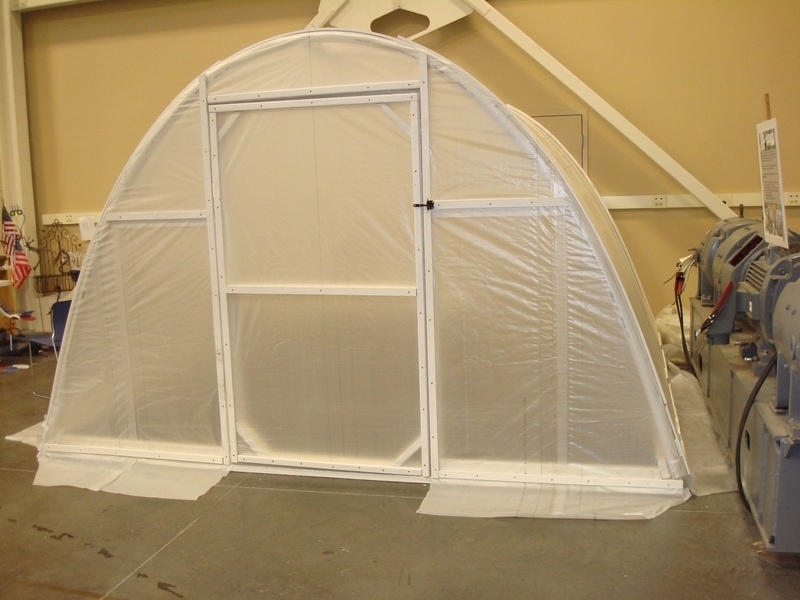 Two weeks ago I went to the Wyoming Master Gardener Conference in Gillette, WY where I learned how to build a snazzy hoop house and how to make Strawberry-Basil ice cream. I also learned a bunch of stuff about native plants and even more about poisonous plants and fairy gardens. It was great! I even hitched up Nadine, my camper and pulled her over to Gillette to sleep in. Of course since this conference was in Wyoming – in April – it rained and snowed every blessed day and the wind blew like crazy. It was 80 degrees and beautiful the week before – go figure. Anyway it wasn’t a total bust – I did discover a few things about Nadine – she has a leak above her front window so one corner of the bed was a little soggy. I’m pretty sure she has no insulation in her walls. The jack on the front of her hitch is broke (thank goodness for Handy Man jacks) and the furnace still doesn’t work but thankfully, I had packed a small electric heater that warmed her up in about 15 minutes so it wasn’t too bad even though it was 30 degrees outside. Nadine also doesn’t have a very secure lock on her door so being the ‘ready for anything, Boy Scout Mama’ that I am, I fashioned a dead bolt for her door once I got to the campground. You can’t be too carefull! 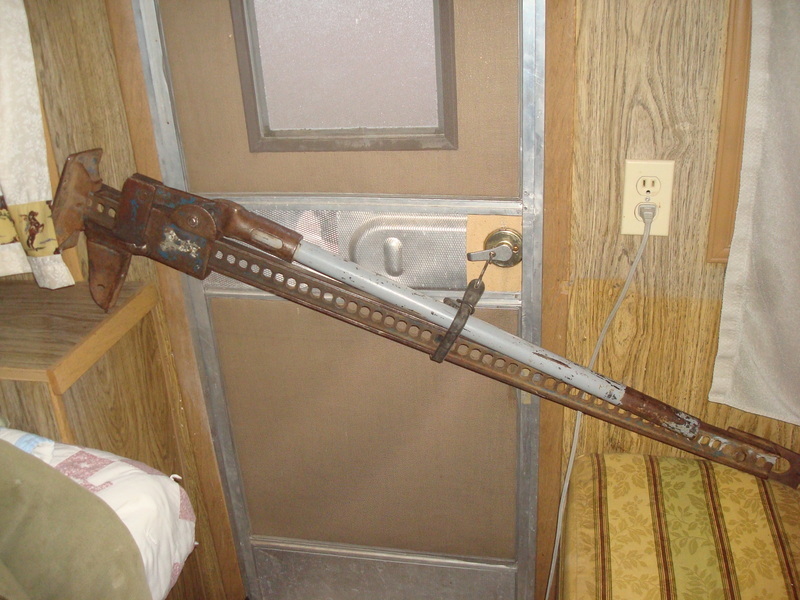 One Handy Man Jack plus one load binder and you too can have your very own Redneck Dead Bolt. Perhaps I should patent it. There was no way anyone was going to break in and surprise me in the middle of the night! At least not without having to tear the door knob completely out of the door. My Dad said I could have also used the removable handle to beat an attacker senseless if needed. Yes, my beloved Handy Man Jack – the all around survival and self-defense device of every ranch wife. 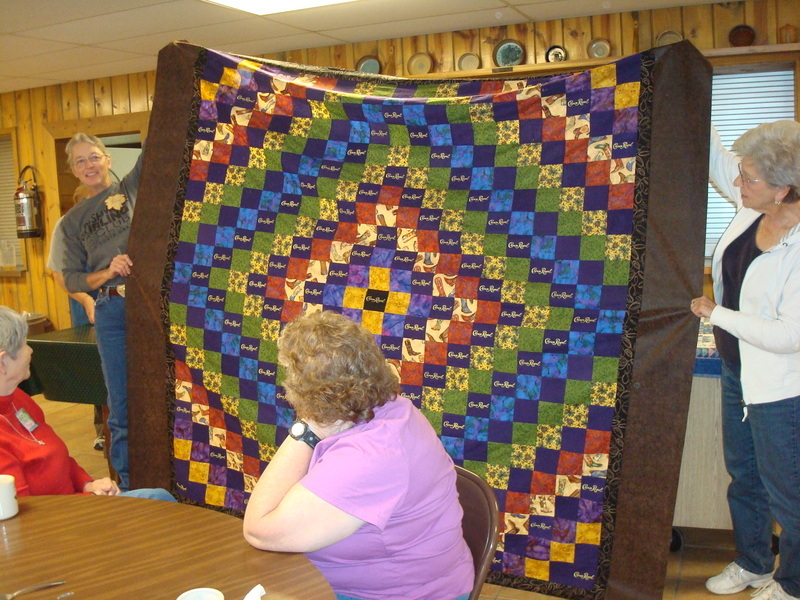 Last weekend I went to a Quilting Retreat at Outlaw Bible Ranch just outside of Custer, SD. Nadine stayed home and I stayed at my parents house which was much warmer and drier. My baby, Morgan had requested a Crown Royal quilt made from the purple flannel bags the whiskey comes in so this is what I made while I was there… at a Bible camp… with 40 good God-fearing Church women… I made a quilt out of whiskey bags. I am so going to Hell! 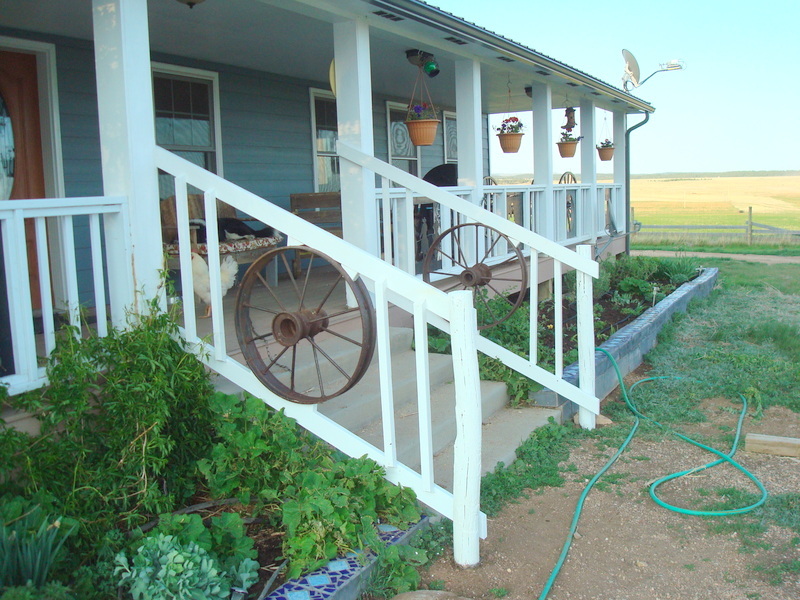 Last but not least, today I finally built the railing for the front steps. We have absolutely no idea what those cool metal wheels are off of but Morgan found them in the iron pile and he brought them to me. I really love that kid! 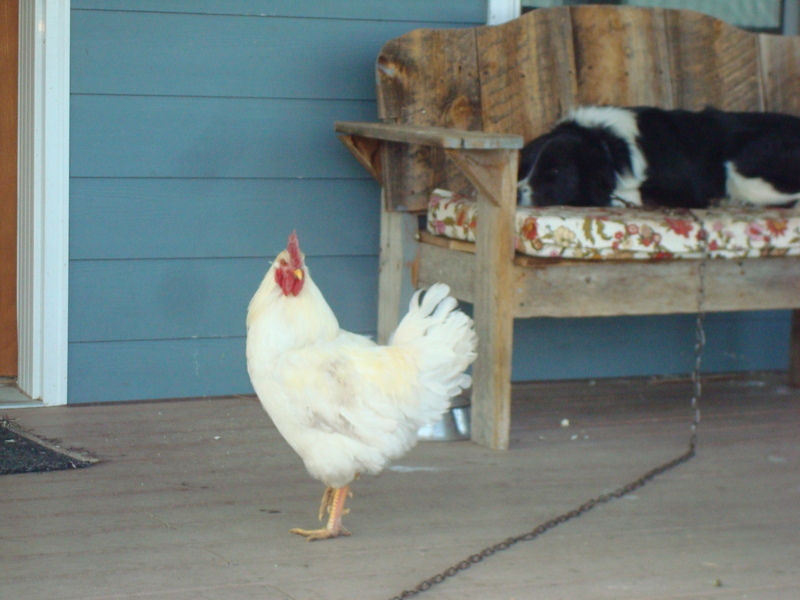 Levi (the dog) and Franklin (the rooster who lives on the porch) supervised the whole operation so you know it was done right. Franklin is very picky when it comes to the details. They were very impressed by my carpentry skills. Can you tell? Other than that it’s been work and lots of gardening. 1. 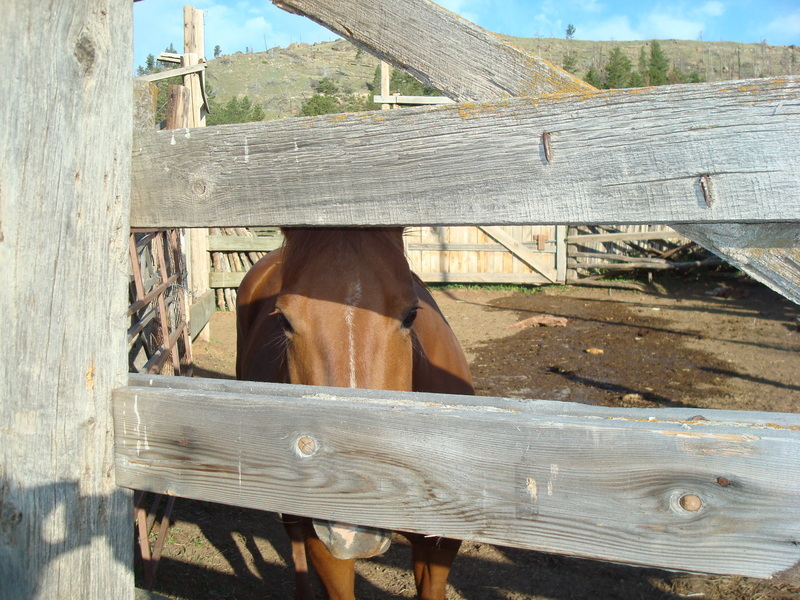 Mother’s Day is spent in the corral – dehorning, branding, de-lousing, doctoring, vaccinating and castrating. 2. You go to the bathroom and while you’re there you carry on a one-sided conversation with the bum calf, chicks, lamb or baby pigs that are temporarily living in the bathtub till the weather warms up. 3. You receive gifts such as chain saws, post-hole diggers, back hoes, dump trucks, a milk cow or a load of well-rotted manure and you are thrilled!!! 4. The bum calf, chickens and every other critter on the place eats supper before you do. 5. You work full-time at the ranch but also have an 8-to-5 job in town just so you can rest and heal up from the ranch work. 6. You can back down and turn a charging cow with nothing but a kitchen broom in your hands and the crazed look in your eyes. 7. You can imitate a cow lowing well enough to calm a scared calf. 8. At least once you’ve lost both your boots and both socks to 1 foot of sucking gumbo mud before slipping and face planting yourself just to save your baby who is stranded in the center of the corral because he thought it would be fun to play in the mud. 9. You’ve ever zipped your 2-year-old child inside the front of your Carhart coveralls so they could stay warm while you do chores. 10. You’ve raised more 4 legged babies than 2 legged ones in your life time.